This week we will be getting a large shipment of new glassware. Why is this news, and why am I writing about it? Because our philosophy is to provide the best beer experience possible for our customers without compromising all of the work and creativity it took to get the beer in the glass. To me, this is exciting because you get a better representation of the art and science of beer making. 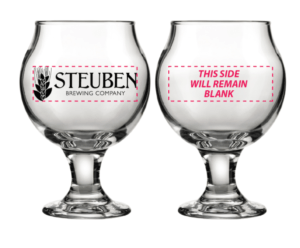 Think of it this way: it is glassware tailored to the beer you drink. It is more work for the servers and more expensive, but it will be a better experience for the customer. 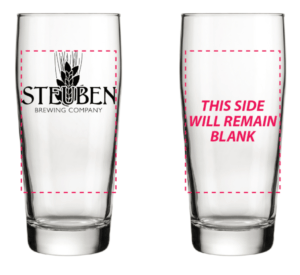 The traditional pint glass, which is actually a shaker glass designed for mixed drinks, will be used sparingly. The shaker works, but it does not provide the best experience. The optimum aromatic and flavor profile is what we are shooting for. In place of the pint glass (shaker), we will use a Willybecher glass (see below)—the pint glass commonly used in Germany. Its shape is much more of an arc, allowing for increased aroma and palate sensory as well as increased head retention. IPA’s will now be served in a Teku Goblet (see below). The Teku glass was designed by a beer sommelier, called a cicerone, and craft brewers. It uses an angled bowl shape to capture the aromatics of the beer and improve the expression of the palate. The stem keeps the consumer’s hand from warming the beer. It is considered to be the ultimate beer glass and the best beer drinking glass in the world. We will be upgrading our tasting glasses to a 5 oz. Belgian glass (see below). 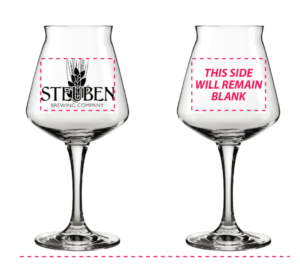 The shape of this glass will also enhance the head retention, aromatics and overall flavor perception of the beer. I hope you enjoy this enhanced way to taste and enjoy our beer.